Wow. Just look at that dessert! Gorgeous. I am not a huge chef but there is nothing I love more than cooking with “everything.” I love being frugal and having yummy food. It is not exotic but once a week I cook a whole chicken. We have a delicious roast chicken dinner, then chicken sandwiches or chicken soup with yes, the stock I made from the chicken! I never throw away carcasses now – and it makes me bizarrely happy. I live in Chile but some expat experiences are universal. Ditto to what Elizabeth said! What a great interview! My mouth started watering looking at the picture of the amazing desserts. 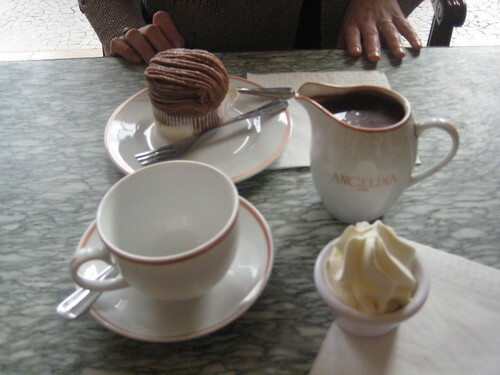 Actually, it brought back amazing memories from my trip to Paris and the food…THANK YOU. Such a small world. Liz and I went to the same highschool, great interview! Just added this book to my wishlist — it sounds great. I loved the interview and I want to get a copy of her book now, especially to try some yummy French recipes. :) Thanks! 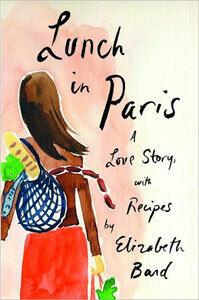 I love anything to do with Paris and food–so I added this book to my wishlist. Thanks for bringing it to our attention! I think I might buy it as a birthday gift for a friend too. Hello, I’m french and I’m following your blog since a while :) This interview is very interesting ! About christmas cookies, it’s true that we don’t bake it, it’s not in our habits (personnally, I love too much the Christmas Mincemeat from England but I know french people who hate it, because its taste is too weird for them !). But it depends on the regions in France. In Alsace, there are a christmas cookies tradition, which are probably inspired from Germany’s Christmas Cookies. Fortunately there are still people like you to be interested in the French cuisine! Thanks for the interview – I just came back from a trip to Paris (I have an almost identical picture from Angelina’s, I had a different dessert) and loved the food and the markets, so now I have to pick up this book. I get kinda depressed walking into the grocery store since returning home because I miss the market experience in Paris!